When people start a new thing, most probably they will make mistakes since their knowledge about that particular thing is low, Same goes for Blogging. 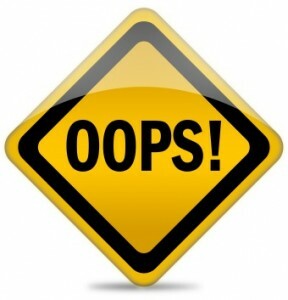 Many new bloggers make some common mistakes which create problems in future. Some mistakes are ok, as you can correct them afterwards but some can lead to serious damage to your search engine rankings, traffic etc. So it is best to avoid them at early stage, so that you can enjoy its benefits in future. I'm blogging since 2009 and let me you that I've made many mistakes in my blogging phase. I've learnt a lot from my mistakes and always tried to correct them asap! So Today I'm here to share my experience and thus I'm writing this post to list out 10 most common blogging mistakes which should be avoided. Template attracts visitors to explore your blog. If your template is not good, then It won't attract people and people may leave your blog. Appearance is an important factor and I believe it is as important as Blog content. Tip: I suggest you to choose attractive templates with light color background. Never choose templates with Black or Dark background. Templates with Black background put very bad impression on some people, They may associate your blog to Hackers blog, Plus blogs with Dark background and different color fonts may make your readers uncomfortable and they may Stop visiting. This is a very bad habit, Stealing Articles from other blogs can result in SEO failure. Search engines like Google easily recognizes copied content and may Ban you from search results, Crawlers might stop visiting your blog resulting in No traffic. A blog should be updated frequently for your visitors to keep coming again and again. So stay active and keep bringing new posts. I recommend that you should update your blog with fresh content more frequently, If possible everyday but if you can't post everyday Try posting one post every 3-4 days. Many Beginners Start blogging only for money, This is not bad But focusing only on money can ruin your plan. Some people join various Advertising programs and put too many Affiliate Advertisements on their blogs. Spamming your blog with Advertisements is not a good idea, Readers usually get irritated with this kind of behavior. So try using less ads in your blogs. Tip: I recommend combining Google Adsense with an In-Text Advertising network like Infolinks or Kontera. Also See: Top Paying Advertising Networks to Earn Money from Website. Changing domain affects SEO, Google will treat your new domain as a new website and this means PR0. So If you want a .com domain then please change it when you begin, If your site has a decent traffic then don't change your domain ever, This is very Risky. I am too a victim of this syndrome. I used to have a blogspot domain with 6000+ pageviews per day and I changed it to .com domain and I lost a big amount of traffic, So I don't suggest any one to change their domain if their blog is 3-6 months older. Tip: If you want a custom .com domain then make sure you switch to it when you start. Think of it as an investment, investing $10 is worth the risk of changing domain. Also See: How to Buy a Custom Domain and then Adding it to Blogger. When starting to write blog, First take some time to choose an appropriate nichie (Topic). Just because an Idea is popular doesn't mean that it will drive traffic. Knowledge is very important. To make a successful blog always write topics you know the best. Readers always love authors with deep knowledge about the topic they're interested in. Tip: Selecting a right nichie is very important, So I recommend you to spend some time to deciding what right for you. No more tips!!! Domain names are also important, Good Domain names with keywords always rank higher in Search engines. So when choosing domain Try using a keyword related to your nichie in your domain (eg: supercars.com for a blog related to cars). Don't use hypen (-) or numbers, I know what you are thinking ;). The common the keyword in your domain, The more rank it gets. Tip: Try Avoiding Long domain names, Make use of keywords in domain (only niche related keywords), Try to Avoid use of hypen (-), underscore (_), or numbers in your domain. Reader who question you using comments always hope for a reply and If you don't reply, the reader may search for other sources to get his question answered and this may lead that he won't come back. Replying to comments is a very good habit, People will love this and comment more. Remember Readers always have questions and confusions and its an Authors duty to clear their confusions. So interact with readers, reply to their comments, listen to their opinions and blog accordingly. Tip: Always take some time out for Replying to Comments, Emails etc. You can also add a Poll on your sidebar for asking questions like 'What they want to see on your blog' etc. If I am writhing about a particular topic, Say Blogging tips and my article is 10 blogging mistakes, It is always good to link your previous posts related to same nichie which you think your readers may be interested in. For Example: 'Check out my previous post about How to install CommentLuv on Blogger'. Hope its clear. Tip: Make a habit of linking your previous posts related to same topic. When people find your Blog through Search engines or other sources, They may not always remember your blog name and May lose it. So always add Subscription links to your blog, so that visitors can easily subscribe to you using RSS feeds or Social networks. So try avoiding these mistakes and This will definitely Increase your Blog popularity and Page Rank.